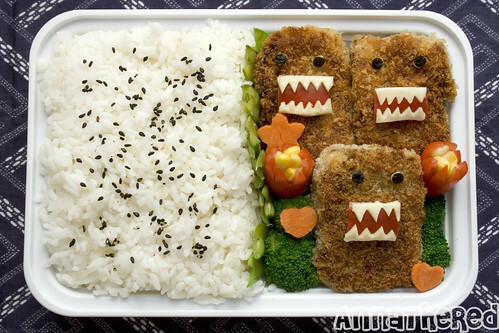 Posted by AnnaTheRed in how-to - characters (Ghibli, video game, Wall-E). 1. 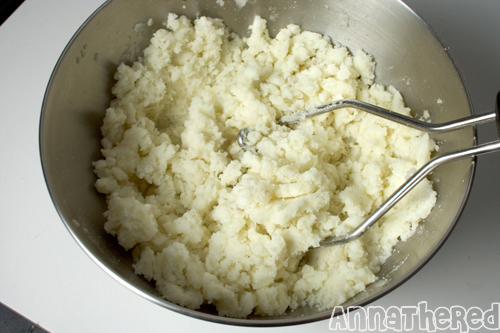 Make mashed potato either by boiling, baking or microwaving. Peel the potato or scoop out the contents with a spoon and mash! 2. 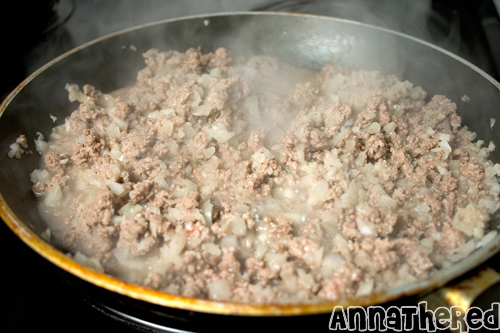 Cook chopped onion and minced beef until liquid from the onion and meat is gone. 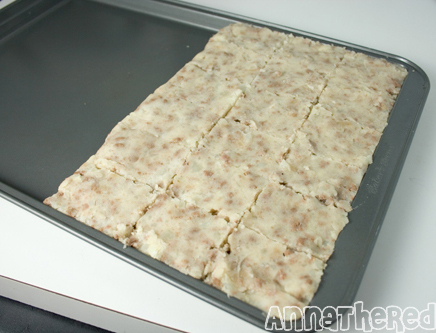 If you have “soboro” already made or want to use tuna, skip to Step 4. 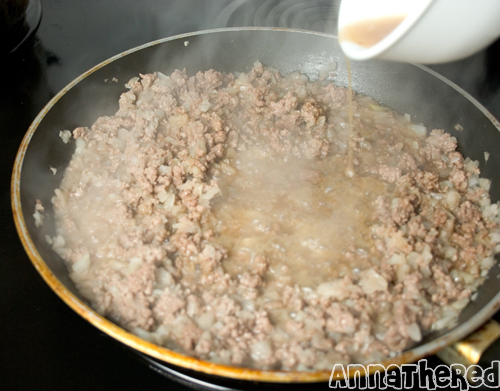 Make sure you cook until the liquid from onion and meat is gone. 3. 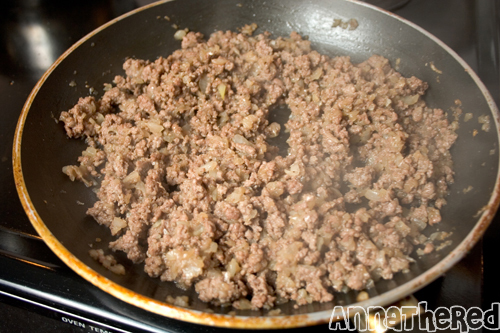 When the onion and meat are cooked, season it with soy sauce, sugar and sake, and cook until the liquid is gone. *As I stated in the beginning, this seasoning is optional. Make sure you cook until the liquid is gone. 4. 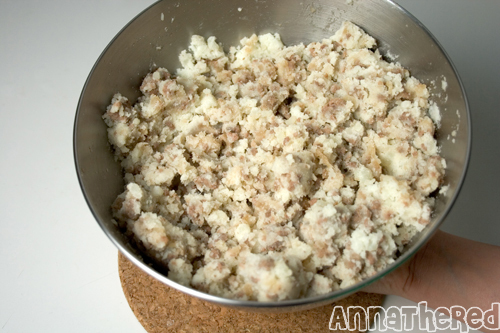 Mix cooked meat (or soboro or tuna) into the mashed potato. 5. You can just mold mashed potato in a rectangular shape with your hands, but I spread it on a baking pan, flattened it and cut it with a butter knife. 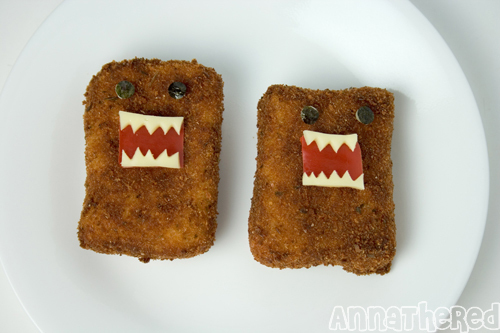 This way, each croquette is pretty much the same size, and also it makes it easier to make rectangular shaped Domo-kun. Don’t make them too big though. If it’s too big, it might break when you’re putting it into the egg later. 6. Cover shaped mashed potato with plastic wrap so it doesn’t get dry, and put it in the fridge for 15~20 minutes or until the potato and meat is completely cooled down. This process is very important! 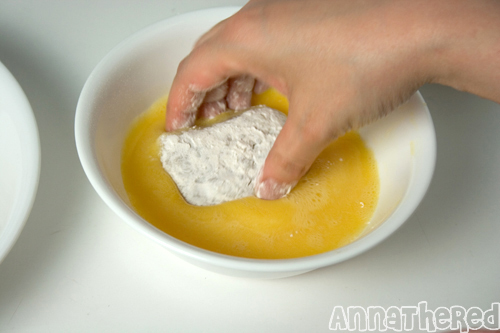 If the potato isn’t cooled down, the croquette will break apart in the oil. 7. 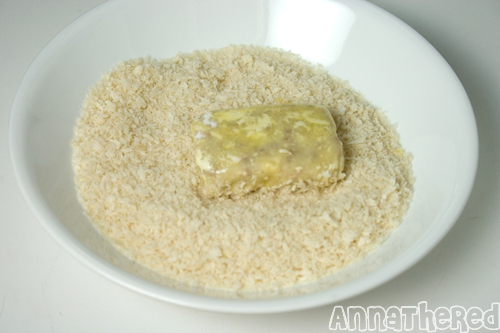 Once the potato is cooled down, put it in flour, and then into beaten egg, and into panko/bread crumbs. I used both panko and regular bread crumbs so people could see the difference. 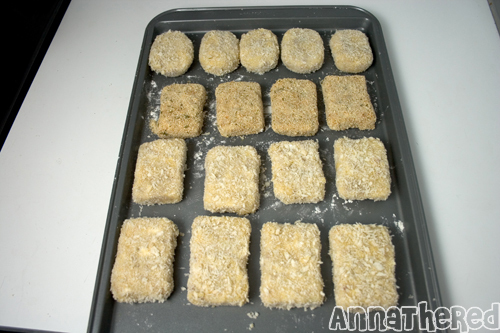 *If you want to freeze, you can put them in the freezer after you put bread crumbs. 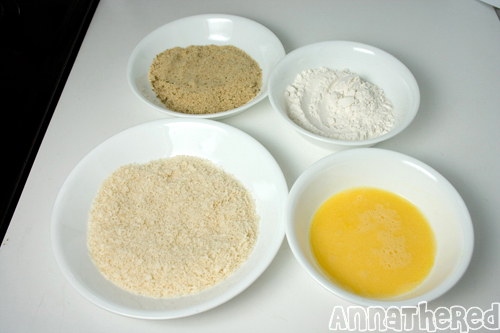 From the top left: Bread crumbs, Flour, Beaten egg, Panko. 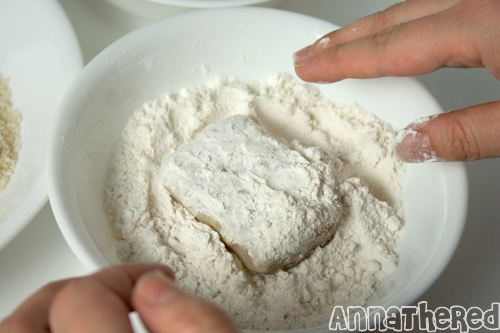 Carefully put flour on a croquette. It gets messy when you put croquettes in egg, so I usually put flour on all the croquettes first. 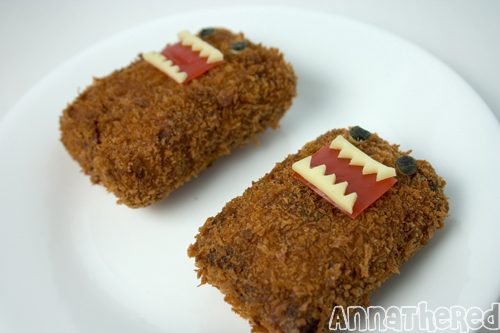 Put egg all over the croquette without breaking it! 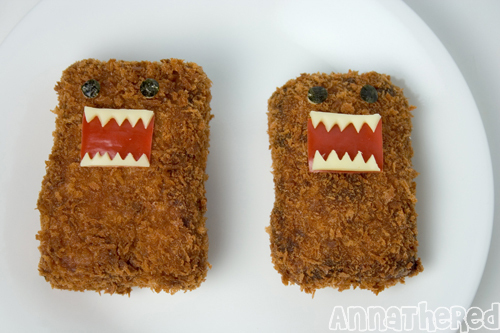 As soon as you put egg on croquette, put it in a bowl of panko/bread crumbs and cover croquette with panko/bread crumbs very well. 7. 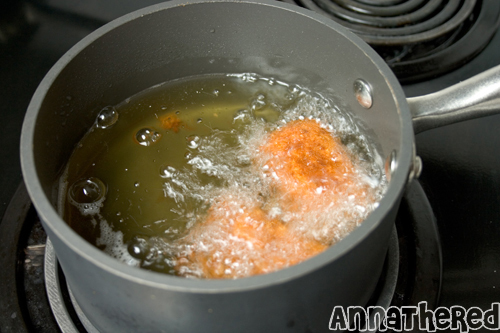 Heat up vegetable oil at medium heat, and when the oil is hot, carefully put the croquettes in, one at a time. Tip: Don't put too many croquettes at once. It'll lower the temperature of the oil and it'll takes very long to cook. Tip: Once you put them in, DO NOT MOVE CROQUETTES AROUND! Just wait until they come up to the surface. *I’ve tried frying in a frying pan, but because the croquette’s skin was touching the bottom of the pan, and the skin started to fall apart when I flipped them. So I highly recommend deep frying. 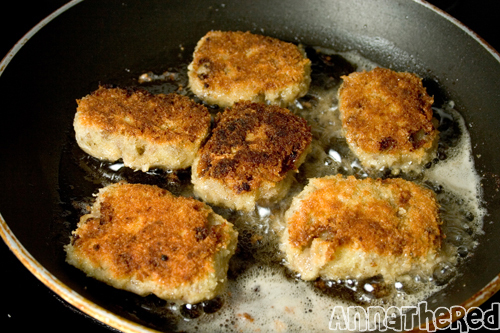 *I've tried pan frying croquettes before: What a mess! You can still eat it, but it's a quite messy and the color is very uneven. 8. 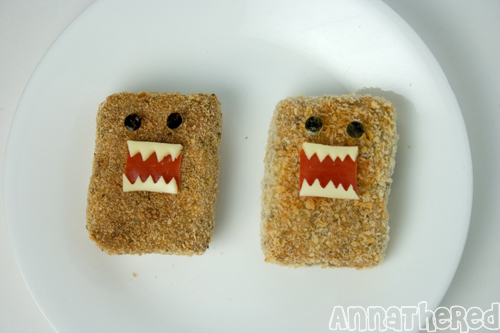 Use a straw to cut cheese, and put cut seaweed on the cheese for the eyes (I used a hole punch). Cut red pepper into square for the mouth, and cut cheese for the teeth. 9. 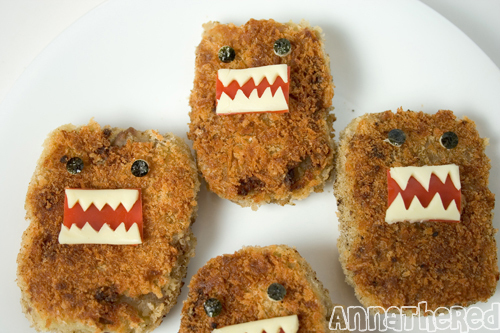 Once the croquettes are cooled down, put eyes and mouth on the croquette! 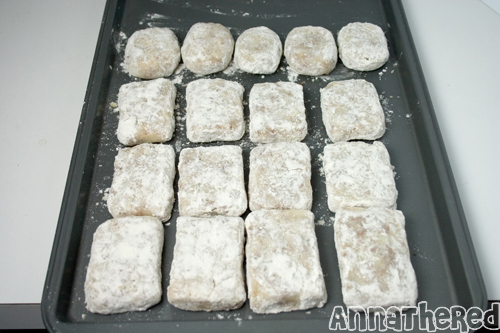 It seems like a lot of work, but if you’re making a lot of croquettes at once to freeze them like me, it’s so worth it. (It’s very cheap to make it too!) 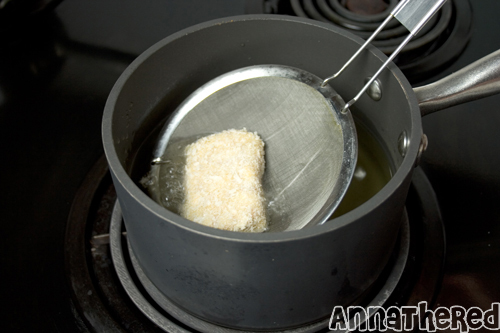 When you’re frying frozen croquette, you should bring the frozen croquettes to room temperature OR microwave it to cook the inside the croquette (stick a toothpick in a croquette to see if it’s cooked inside) before frying it. If you fry it while frozen, it’ll break apart in the oil.